OUBac in the 1950s - O.U.Ba.C. The University had the use 3-4 afternoons a week of the one court at Northway Drill Hall for trials and general club play. The league matches (Bucks, Berks and Oxon league division 1) and other 1st team matches were played at The Old Gaol at Abingdon (2 courts). The standard of play was not particularly high and suffered from some of the better players often preferring to play for 'full blue' sports e.g. Ned Larsen (squash), Geoff Cass and Rafiq Ahmed (tennis). However, the fixture list and hence the standard was gradually enhanced by the edition of games against Worcestershire, Hampshire and Staffordshire sides. There were no lady players! At some time in the late 40's the derelict building was developed to hold 2 side-by-side badminton courts. There was very little heating and on very cold days non-playing participants would huddle around small heaters. The changing rooms were two old glider bodies (presumably relics from the parachute and glider forces at the adjacent airfield) and there were no showers. It all added character to any game!! Best of three 15 point sets. At '13 all' one played to 5 points and at '14 all' one played to three points. Rackets were still wooden framed and playing the shuttle off the wood was an immediate false shot. 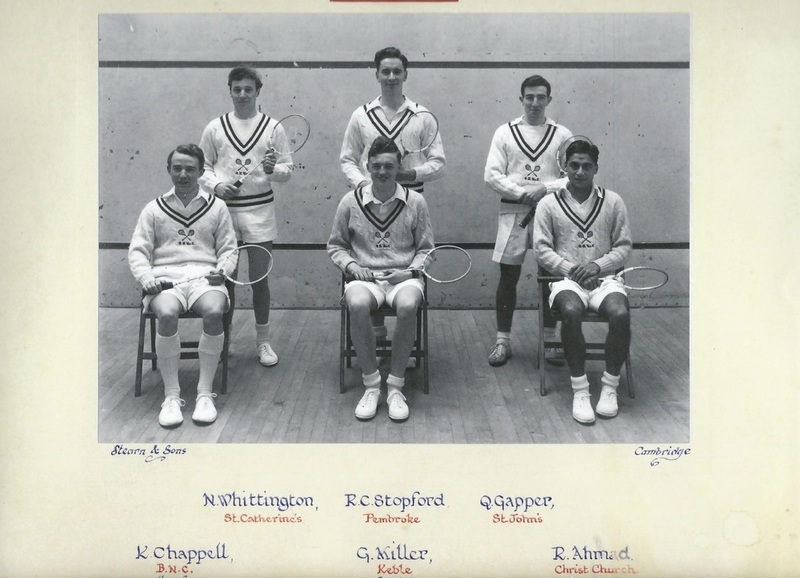 Dunlop supplied each member of the team to play Cambridge with 2 free rackets each year. At service the racket head had to be below the waist. In the games '52, '52, '53, and '54 Oxford were overwhelmed: 15-0, 15-0, 14-1, and 15-0. At that time Cambridge were undoubtedly the strongest side in the UK. This was the name of the University 2nd team. The team only played once a year under that title against the Cambridge Cockerels.